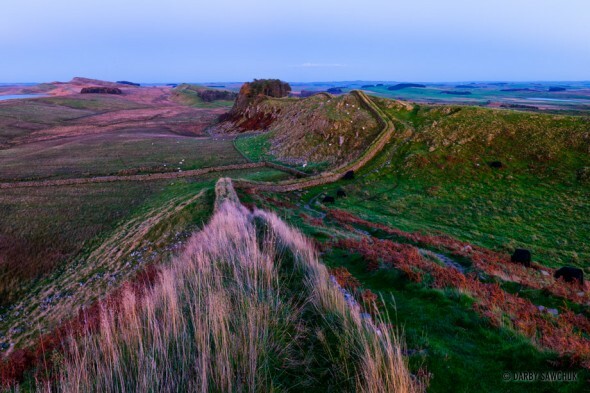 Hadrian’s Wall rises and falls with the undulations of Hotbank Crags. I took this picture only a few feet away from the previous photo of the day, but the effect of it is pretty different. In the cool, purple of dusk, this shot really emphasizes the line that Hadrian’s Wall follows along the crags. The Roman builders of the wall knew what they were doing. As much as they could, they used the natural cliffs and steep slopes of the land to form the better part of their defence. When the wall you’re building spans the length of an entire country, you better make sure you use every shortcut you can. It would have been quite a spectacle to behold in its original form, but even today, it’s an impressive sight. One funny detail I only noticed after processing the image: All the black cows are on one side of the wall and the white sheep on another. Can’t we all just get along? A brilliant, saturated sunrise rewarded my efforts to wake early and trek up the hill to get this classic shot of Hadrian’s Wall from near the Housesteads Roman Fort. I took plenty of shots from at or near this vantage point at various different times of the day, but I think this is my favourite. 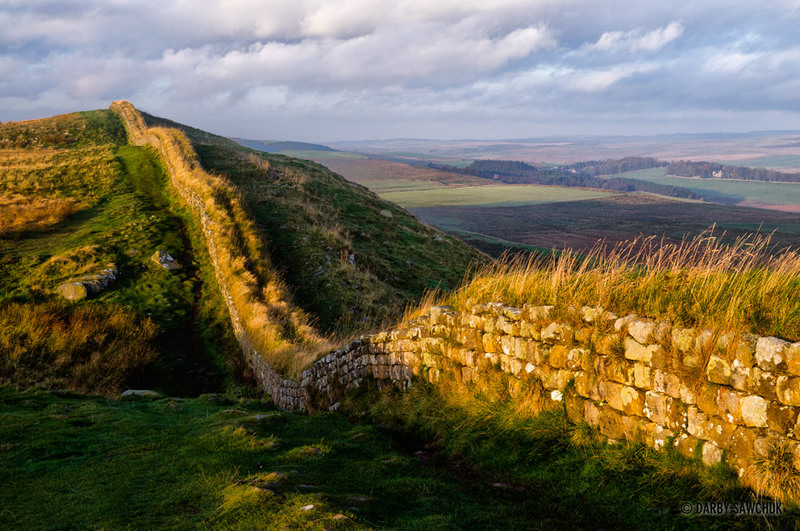 It captures both the detail of the wall and its snaking path along the crags while also showing some of the surrounding countryside bathed in a light that had me applauding Mother Nature. I’ve now managed to process a few shots from this trip as well as more from the earlier visit to Scotland, so those will trickle through in the next the next little while and I’ll try to show off images from some of the top landscapes in the UK. One chilly March morning, a couple nights after a rare English blizzard, we drove along back roads near nameless sections of Hadrian’s Wall. The sun dashed in and out of the thin, high clouds. The cold didn’t deter us from stopping the car and walking along a random ruined stretch of the former Roman wall. The visit was all too brief and Hadrian’s Wall deserves far more than the couple clicks it got from me on that abbreviated morning stroll. I would happily take on a project of landscape photography in that area. That would mean early mornings in isolated countryside watching and waiting for the light to change over rolling hills intersected by a centuries-old stone echo of history. Sounds like a good way to spend some time to me. Click the thumbnail for a larger version or see it in the landscape section of my portfolio.